Compiled by: Angelika Jakobi, Tanja Kümmerle. Series edited by: Franz Rottland †, Rainer Voßen. 10 pp. Roman, 138 pp. 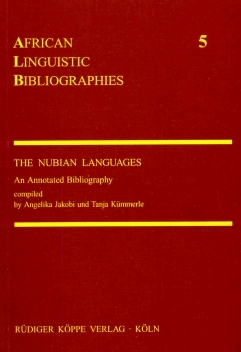 The present volume of the series African Linguistic Bibliographies presents an overview of the geographical distribution and the linguistic classification of Nubian languages. This is followed by a list of periodicals and an alphabetic list of the Nubian languages, including their affiliation to the respective subbranch of the group. Furthermore it presents an exhaustive bibliography on the field of Nubian Studies. Als Resümee ist festzuhalten, daß die fundiert und liebevoll zusammengestellte Bibliographie ein umfassendes Bild der Materie entwirft. Sie stellt damit ein unentbehrliches Hilfsmittel für alle jene dar, die sich mit der Sprache und Kultur der Nubier beschäftigen. Die vorliegende Bibliographie stellt einen wichtigen Beitrag im Bereich der Nubisch-Studien dar. Zum ersten Mal sind die linguistischen Monographien, Wörterbücher, Aufsätze und ähnlichen Publikationen zusammengestellt, die explizit eine der nubischen Sprachen zum Gegenstand haben. Auf 91 Seiten (S. 29-119) werden in einer knapp, aber konzis und erhellend annotierten Bibliographie die wichtigsten Werke aufgeführt. The present bibliography demonstrates how the study of Nubian languages has flourished, especially over the past thirty years. It is an excellent compilation and and indispensable reference work for anyone working in the field. [...] The bibliography covers the whole group of Nubian languages including the texts of the medieval period. These languages are classified here according to the system of Marianne Bechhaus-Gerst which is significally different from earlier schemes of classification and which will stimulate critical discussion. The compilers consulted other scholars in the field extensively, but clearly tried to check each reference themselves and indicated wherever they were not able to do so. They have made substantial improvements on previous bibliographies, including my Place Names in the Belly of Stones (1970). [...] Angelika Jakobi and Tanja Kümmerle have a major achievement to their credit.